Enjoy two different perspectives on Cartagena during this evening tour. 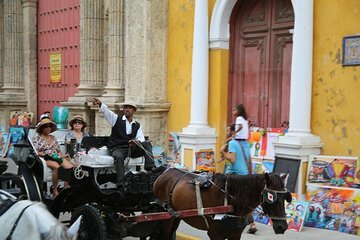 First, discover Cartagena’s colonial–era walled city when you travel by horse-drawn carriage. Then, it’s a quick stroll to the pier, where you’ll board a boat and go for a multi-hour cruise of the bay. Pick the sunset option and enjoy rum cocktails and other drinks from the boat’s open bar; the dinner option, meanwhile, includes a four-course meal plus wine.